The weather starts to warm up and everyone in the house starts to get excited about pool season. The easiest way to get you pool opened is to call a pool contractor or local professional that does swimming pool services. This year, you are determined to save yourself some money. Follow these steps on how to open a pool and you should be well on your way to a good pool season. Think about how water travels from your pool to your equipment and back to the pool, making sure each part is open and ready to have the water move through it. If you have a solid tarp cover or a solid safety cover, you will need to drain it first. 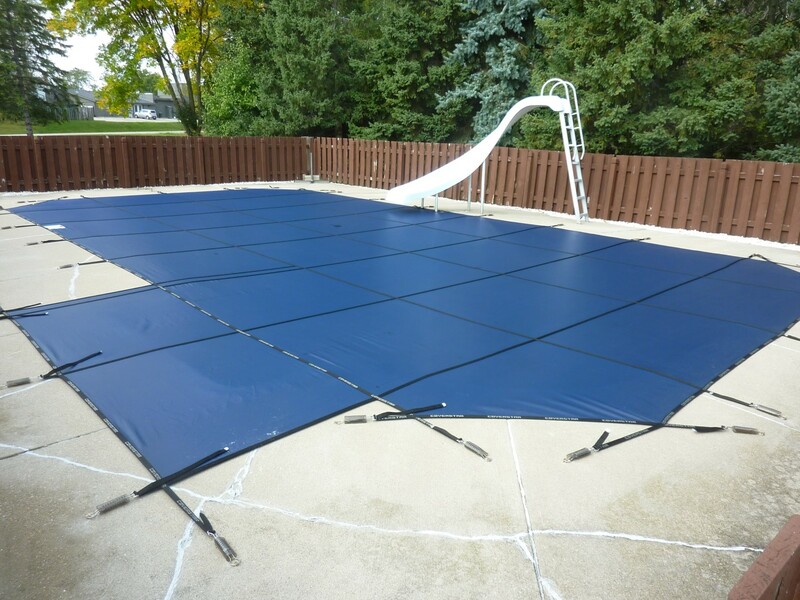 Clean & store your pool cover for the winter. Spay it down to remove all the dirt, then leave it out to dry. Insure that your water level is midway up the skimmer to insure proper operation of your pool equipment. If you have a mesh cover, you will more than likely need to drain your pool down at some point, HOWEVER don't do it right away. Do it after you have cleaned your pool and done any required back washing. Remove all gizzmos and plugs from your skimmers. This is your water going to the pool equipment. Replace all plugs in your pool equipment. Turn valves or filter to waste if you used RV anti-freeze in the lines. Remove all swimming pool opening plugs from your return lines. This is where the water goes back to your pool. At this point, you should have everything open from the pool to the equipment, plugs in your equipment, and returns for the water to go back to the pool. Turn on, or plug in, all the electrical to the pool equipment. Prime your pool pump and start moving water through the system. Here you can see if you have any leaks at the equipment slab that need to be address or plugs tightened. Run your pump for 2-4 days before you start to doing any chemical balancing. If you like, you can add some shock to the pool and an algaecide if your water isn't clear. Opening a pool can go very wrong if you don't allow water to freely move through the system. Built up pressure from an unopened return or valve can burst a pipe in seconds. If you are unsure about the process or don't want to deal with the aggravation, simply call a pool builder who does swimming pool services. Make sure not to fall into some common mistakes when opening a swimming pool. Doing the items correctly today will make it so you don't have issues in the future when you are looking to have a party. If all else fails, simply call anyone who does swimming pool services.